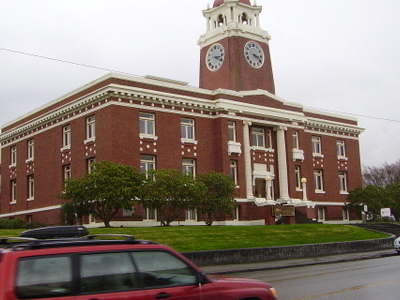 The Clallam County Courthouse was built in 1914 and is located in Port Angeles, Washington. The court house has a bell tower containing a bell which was shipped from Boston all the way around the horn. The building has had at least one addition since it was built. The building uses 126 solar panels, which were installed in 1979, to produce an estimated 20 percent of the electric power needed for the building. Here's the our members favorite photos of "Court Houses in Port Angeles". Upload your photo of Clallam County Courthouse!